Woodwind is the protagonist in SVK, the comic we’re publishing by Warren Ellis and Matt “D’Israeli” Brooker in April 2011. THOMAS WOODWIND: I’m seeing a man of six feet or so, quite lean, with a good Patrick Stewart-ish skull fuzzed with very short pale hair. Paranoid eyes. Tending to very long black coats, probably with poacher’s pockets sewn on the inside. 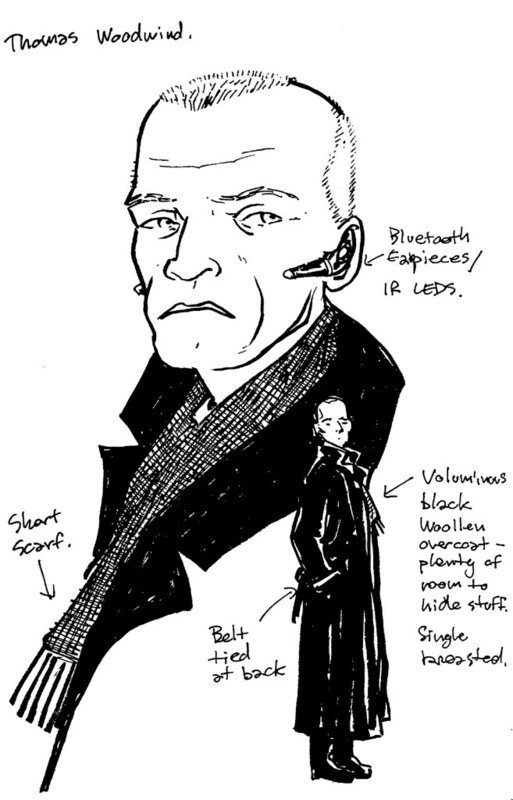 A bluetooth earpiece cupping each ear, with front facing limbs (where the IR LEDS are). Also wears black gloves, I think – no fingerprints, reduction of epithelials.